that allow guests to step right into your photography! At which point, you are taken right into the picture itself, giving you a 360 degree view of the room and actually walk around it and explore fully. Along with the ability to zoom into any part of it you like. When it comes to engaging with your next guest, Act Studio’s three dimensional virtual tours take photography to another level. Perfect for hotels, holiday cottages and much more. 3D virtual tours not only allow you to connect with your guests, they help speed up the booking decision and increase customer confidence that what they are about book will meet their expectations on arrival. So how can 3D video tours work for you? Users simply click on the image to ‘step in’ to the picture, with the ability to turn in any direction to explore a feature in more detail. Want to view the room from the other side of the bed? Easy. Using your mouse (or a touch screen) simply click (or tap) on the picture and spin the view in a direction to suit you. Fancy a peek in the bathroom? Maybe to check if it has a walk in shower? Again, just click or tap on the direction you would like to take. It even lets you leave the room to explore different rooms on another floor. And basically look round the whole property. Which can be really helpful if you need to check if the bedroom is on the ground floor. Or see if the bathroom has a shower over it. The beauty of 3D virtual tours is that they are incredibly simple to use. And extremely intuitive. How does ACT Studios create a 3D tour? ACT Studios uses a special type of camera to create this kind of step in 3D virtual tour effect. As a holiday cottage owner, for example, you will be able to showcase individual rooms as well as the whole house. Which you can even see in miniature, in the interactive ‘doll’s house view’. Alternatively, we can create interactive floor plans, so your guests know exactly how the property will be laid out. For hoteliers, you can use a 3D tour to show guests round all your bedroom as well as other areas of the hotel, such as lobby, restaurant, bar and conferencing facilities. Our professional team of photographers and post production editing can supply you with high resolution, still photography as well as more immersive 3D virtual tours. Want to learn more about 3D virtual tours? What’s the cost of including a 3D tour in my hospitality photography session? Prices for our professional photography services vary from property to property but start from £225 per shoot. 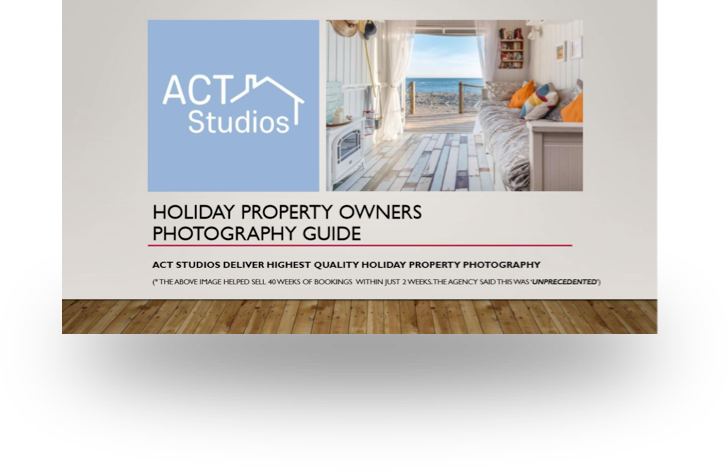 Please call the ACT Studios team for more information and to discuss about your specific visual photography requirements. We can then give you a much clearer quotation for the work involved. How long does it take to create a 360 degree virtual tour? We typically photograph a property using both a professional full frame DSLR camera as well as the special 3D camera, which we then use to create the virtual video tours. The time it takes to photograph a property will obviously vary from place to place, depending on size and the number of rooms or areas to be covered. However, as a guide, it can take in the region of three hours for a standard holiday cottage. So we can cover three cottages on the same site in a day, with both cameras. How easy is it to get the virtual tour loaded on to my website? Super easy! Once edited, we will send you an embed code so you can drop the tours file straight into your site. And it will start to play! And if you have your own team of web designers, we can pass them the necessary code to ensure that every photograph on your hotel’s website offers step in functionality to allow potential customers to take a look round.